As Veterans Day approaches, three Tigard High School graduates who served in Vietnam in the 1960s are hoping to connect with other Vietnam veterans from their respective graduating classes, first by recording and memorializing their stories and eventually holding a reunion. And plans are to reach out to those veterans' families as well. 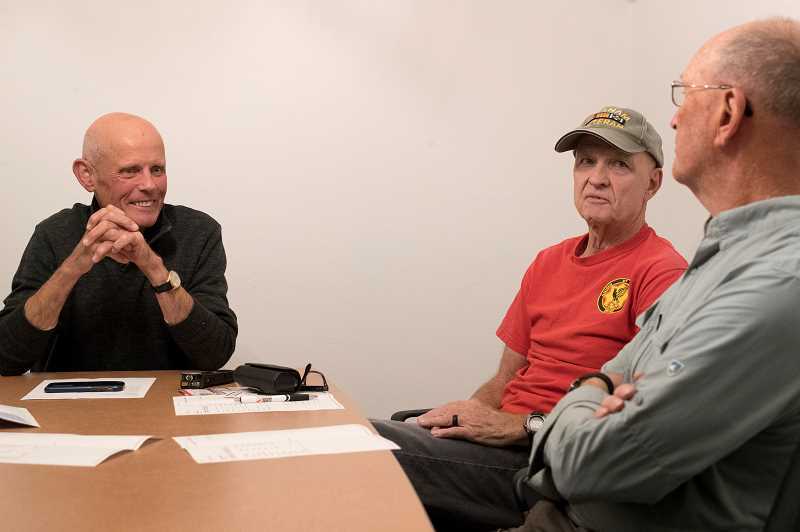 While Howard Boyte (Class of 1965), Gary Chamberlain (Class of 1965) and Mike Miles (Class of 1964) each had a different experience in Vietnam, the war all connected them during a time when Tigard was a small, rural community. Boyte can recall almost every Vietnam veteran who was killed, injured (physically or psychologically) or who had married a Tigard High School classmate all living along a path beginning where he once lived on 100th Avenue, traveling along McDonald Street and continuing along Omara Street. "You can say we had some pretty heavy casualties," he said. Miles, now of Canby, said his brother, who served in the U.S. Marines, told him not to follow in his footsteps. "My brother told me if I want to live, don't do these things and one of them was do not join the Marines," Miles said. "He died of Agent Orange. He was 71 years old." Instead, Miles joined the U.S. Army, ending up as a personnel specialist while serving in Vietnam in 1966. While in high school, Miles' father suggested he take a Tigard High School typing class taught back then by Nellie Elwert. '"He said, 'Maybe when you get into the military, it may save your life,'" Miles said. "It absolutely came true." Boyte took that same class. "She saved my life, too," said Boyte, noting that, when he was wounded in Vietnam, they asked if he could type and he thanks Elwert for keeping him out of harm's way for a while. In reflecting back on the war, Miles made several important observations. They include the fact that he believes U.S. Marines were used as a type of cannon fodder during Vietnam and later came to the realization that America can't just throw body after body into any war. One thing that did surprise him, however, was an eagerness for young people to enlist in the military after the tragic events of Sept. 11, something that he didn't think would happen. Boyte served in the U.S. Marines in Vietnam from 1968 through 1969. 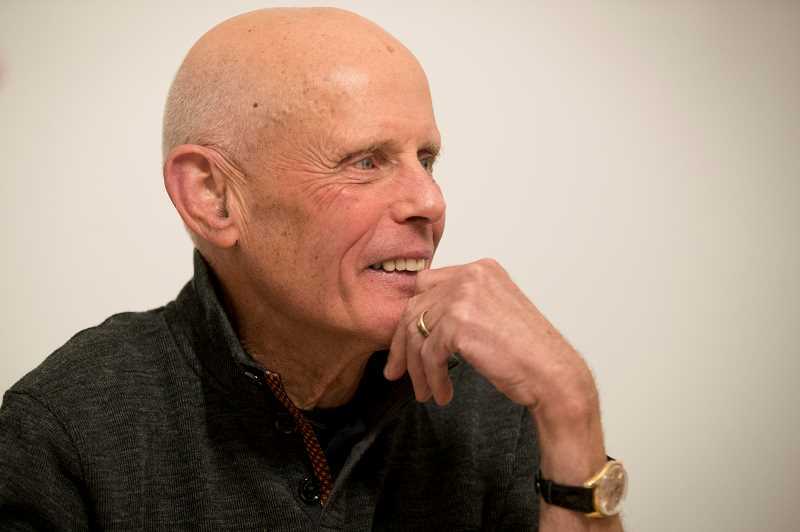 "I was living off the grid, going to school in Mexico City and not paying attention to news about the war," Boyte said, adding that when he left school he lost his draft deferment and enlisted in the military before being shipped off to Vietnam. It would take Boyte a month or so of walking patrols and tripping booby traps, constantly being shot at by snipers and taking over strategic locations only to have them given up a couple of weeks later to make him questions the war. That, he said, along with "winning the hearts and minds of the Vietnam people by burning and napalming their villages." Injured during an ambush, Boyte would later receive a Purple Heart. Chamberlain, too, was wounded during an attack in October 1967 when he jumped off an armored vehicle and gave first aid to soldiers who were wounded before charging an enemy bunker and killing its occupants. "When his ammunition ran out, he returned to the vehicle and dismounted an M-60 machine gun," according to an article published several months after the attack in the Tigard Times. "He used a machine gun to attack a second bunker, but was wounded again by an enemy grenade. Undaunted, he went on to destroy a third bunker." He would later be sent to a burn ward in a hospital in Japan. "I spent my 21st birthday watching 'Bonanza' in Japanese," recalled Chamberlain, whose father started Arrow Heating in Tigard, the annual sponsor of the Cook Park Fourth of July fireworks display. 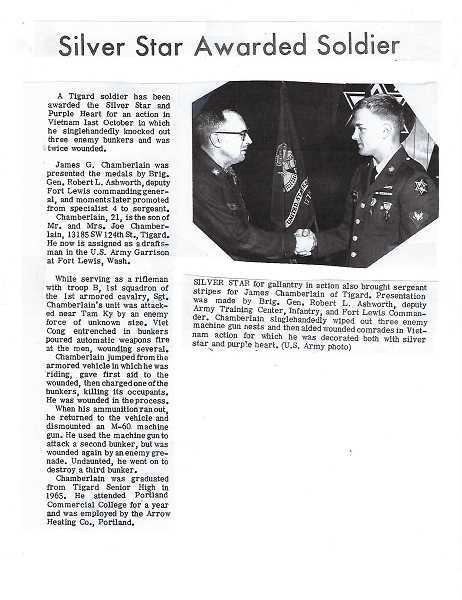 For his actions, Chamberlain was awarded a Silver Star and Purple Heart. Now a resident of North Carolina, Chamberlain recently wrote a piece for his local paper titled "Walking in our Shoes." "I have much respect for non-combat veterans and combat veterans but I have a special bond with combat veterans since they have put their life on the line through their military service," he wrote. "If you walked in their shoes, you would clearly know why I'm partial to this group." Chamberlain returned to Vietnam in the mid-2000s, traveling to Chu Lai. "It was a pleasant trip for me," he said. "I have nothing against the Vietnamese people." Chamberlain said he thinks it's important for families to record the stories of their veteran family members. And that's exactly what Boyte and his fellow veterans are trying to piece together. "What we wanted to do was put together a list of veterans from the era of Vietnam from Tigard High School," said Boyte. "It would be the '60s to the '70s." Since then, however, that list has expanded and the organizing group thought it should include veterans' family members and their wives, all of whom were affected by the war. And, in what would seem as a departure from many veteran reunions, Boyte and his fellow veterans want to include those THS students who protested the Vietnam War. Boyte said his next step is to search for a venue to hold the reunion.